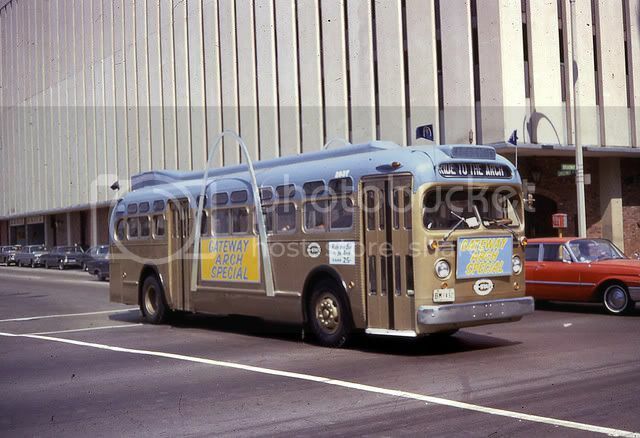 In a photo taken circa 1965 at the intersection of Chestnut Street and Broadway in St. Louis, Missouri we see fleet number 2937 - a GM Model TDH 4512 built sometime between 1953 and 1959 and operating for the Bi-State Development Agency. Number 2937 is dressed up for its special assignment as a 25 cent shuttle to the newly opened St Louis Gateway Arch - the tallest man made monument in the U.S.
Of note is the eye catching sky blue over gold livery, the 'McDonald' shaped arches attached to the body, the flags at each corner of the roof and the fact that #2937 is Air Conditioned (probably a Thermo King job). Established in 1949, the Bi State Development Agency was a merging of all matters of transit in the City of St Louis, the County of St. Louis and the St Clair County Illinois Transit District (an arrangement not unlike that of New York's Metropolitan Transportation Authority and the State of Connecticut in the operation of the Metro North Railroad). In 2003 Bi State's name was changed to 'Metro'. Photo taken by Davis Wilson. You know how Boeing stretched its 737 and 747 models and added 200 and 400 designations respectively? Well get ready for this one; how about trying on a GM TDH 4512-4800 for size? Pictured below is fleet # 2951 in an almost perfect stretch from 44 to 48 passengers done by the artisans at St. Louis Public Service in St. Louis, Missouri. The added thirty inches is evidenced in the 5100 width single window between the narrow single window and the first double set of windows just forward of the rear door. It was very easy to shrink buses in those days and especially the squared window GM's but stretching them was different and a very much more difficult job and a great deal of credit should be given to the mechanics that did this one. My only comment would be that if I had done the job I would have re-fabricated the new transom glass to the same width as the new window below it. BTW; this bus is a cousin to # 2937 above and was ex fleet number 315 that originally operated for Capital Transit Company of Little Rock, Arkansas.